After our Korean outing the other day, I've decided to start cooking some Korean food. I happened (really, it's true) to find some dang myang, or sweet potato noodles in my cupboard, so I thought what better way to start the Korean cooking adventure than making some of my favorite jap chae, or Korean style vermicelli. 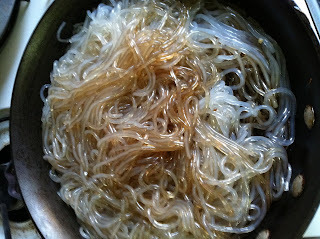 You can find the dried vermicelli in any Asian grocery store. Probably your best bet is at a Korean or Chinese one. It's pretty cheap - about $2.50/pack. You start by boiling it in some water. Real easy, heat up the water, wait until it boils, then drop in the noodles. Add some salt (rock salt works well) to add taste while the noodles are cooking. One thing to note is that they kind of stick together in the package, so it's hard to tell how much it will materialize to be actual noodles. A rule of thumb is that one pack (they kind of come entwined as sticks) will feed 2 people. I dropped in 2 stick packs and that was like a whole pot of vermicelli, which left Hubby and me with leftovers for the rest of the week. 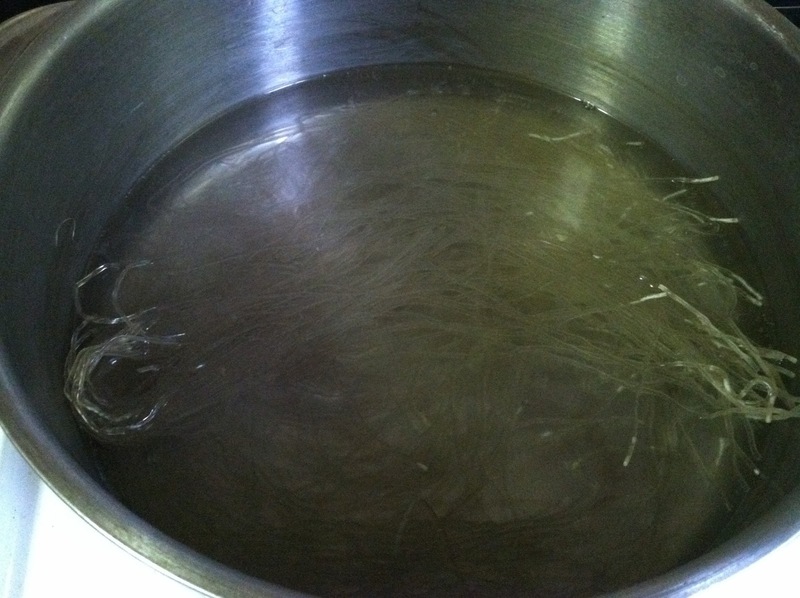 You can see that the noodles become translucent after 10 minutes of cooking. You can turn off the heat once the noodles become completely translucent and soft (you can do a taste test for this). 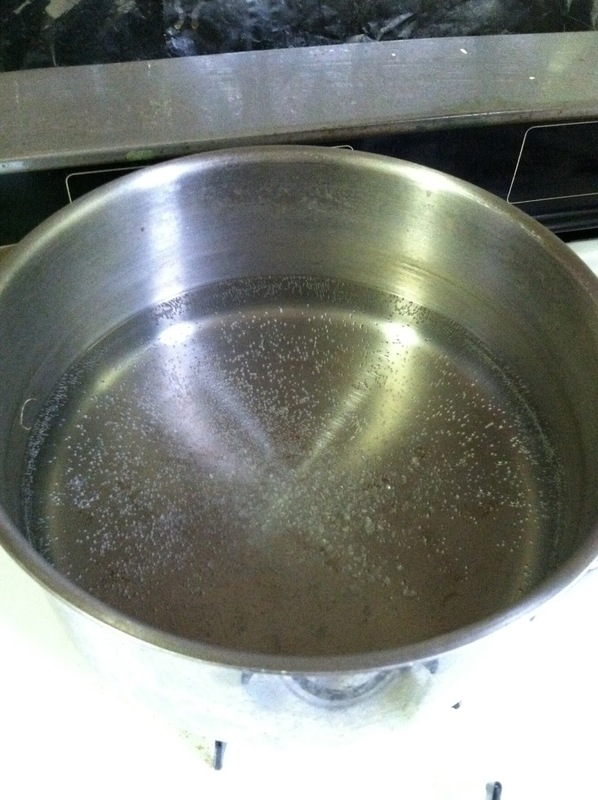 Drain the water from the noodles and soak it with cold water. You want the noodles to be around room temperature when you start the final mixing. 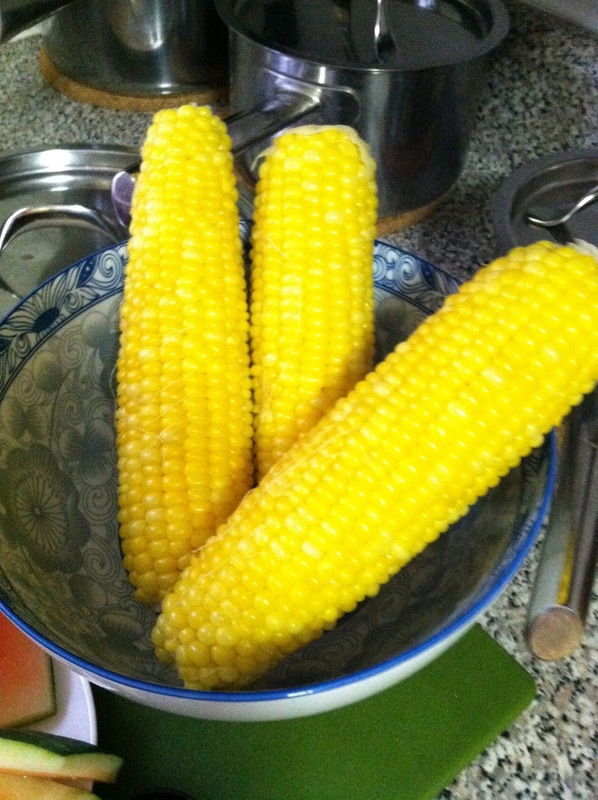 Next, bring out those veggies. 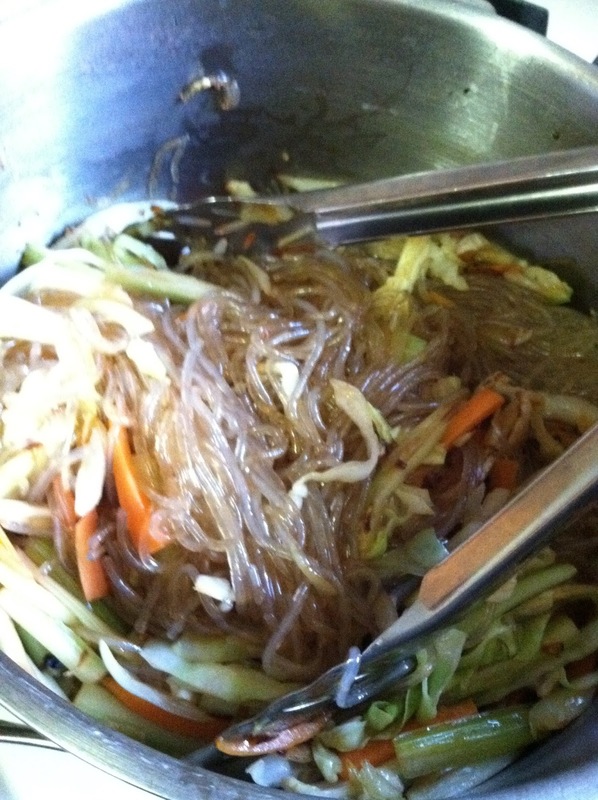 The recommended vegetables for jap chae are julienned carrots, onions, green onions, shitake mushrooms and spinach. 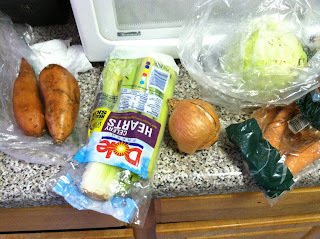 Of that, I found only carrots, onions and green onions in mine, so I replaced the spinach with celery and threw in some cabbage. 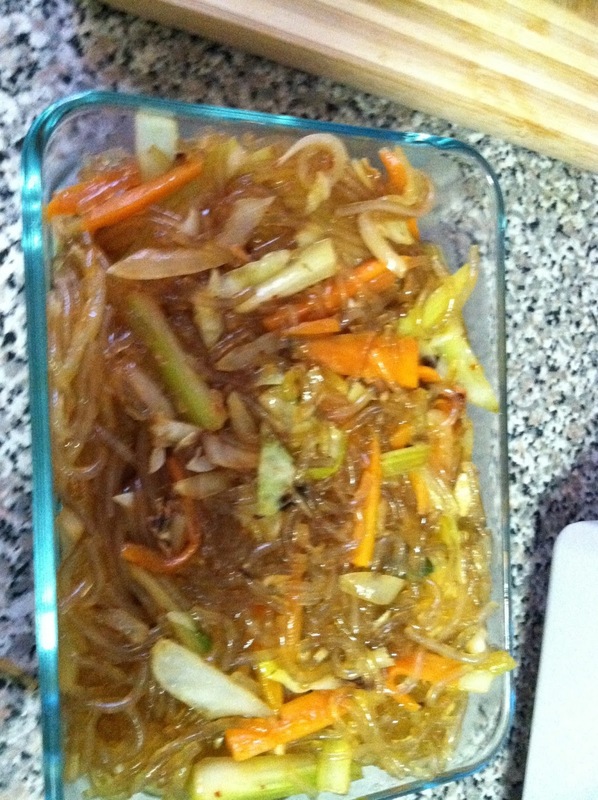 The thing with jap chae is that it's not hard to make, just a long time to prepare all the ingredients. 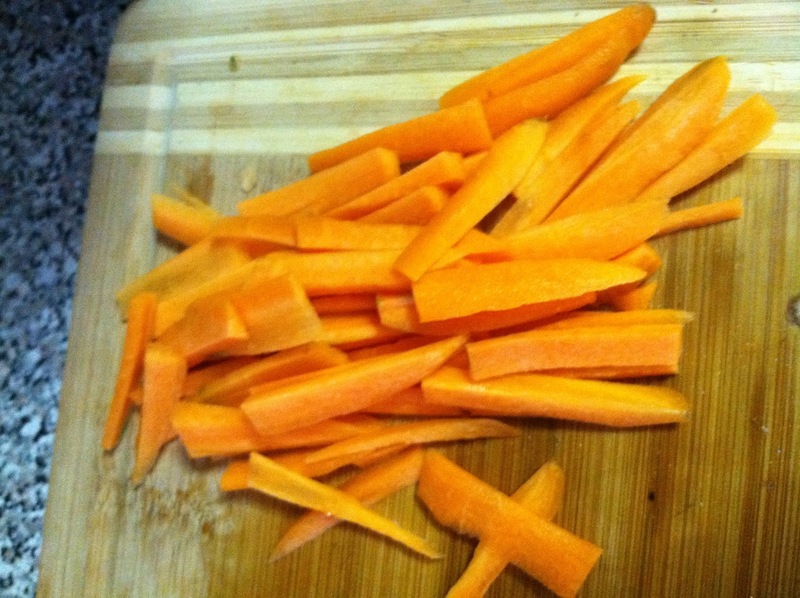 I used two small carrots, but it took at least 10 minutes to peel and then julienne. I'm sure if you used a food processor it would be a lot easier. The cabbage was still pretty fresh when I cut it up, even though it's been in the fridge for about 3 weeks. 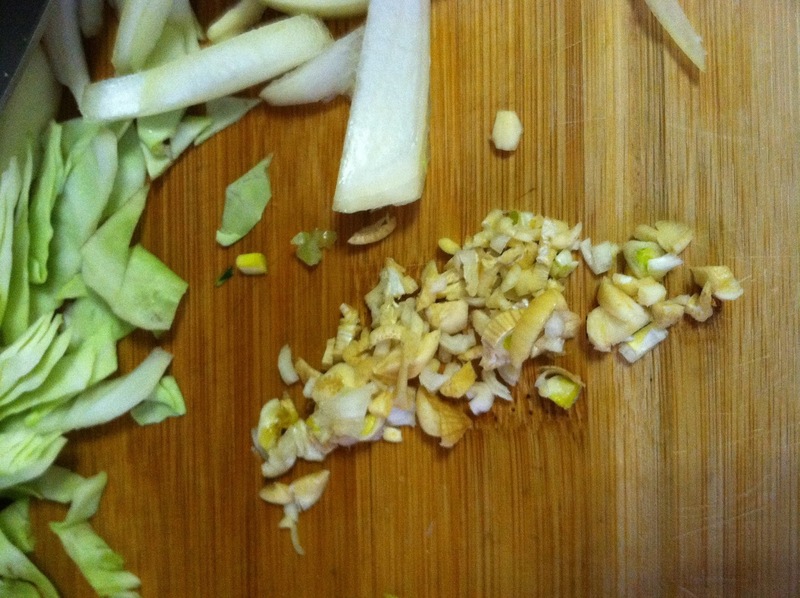 The cutting board gets pretty full after a few veggies, so you mind want to do it the French way and put them into separate bowls. Garlic is always tricky to mince. I ended up with a very colorful cutting board at the end. The next step is to start frying each item. You are supposed to fry each item separately, but if you want to save time then do what I did. I fried up the onions and carrots. 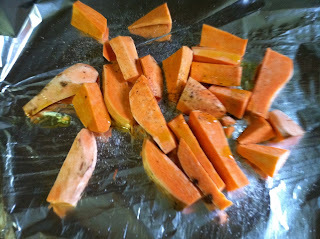 You don't want to overdo this - just fry it until the onions caramelize and the carrots turn a deeper orange. 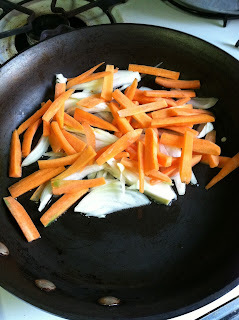 Put the fried onions + carrots on a separate plate or drop it into a large pot for easy mixing later. 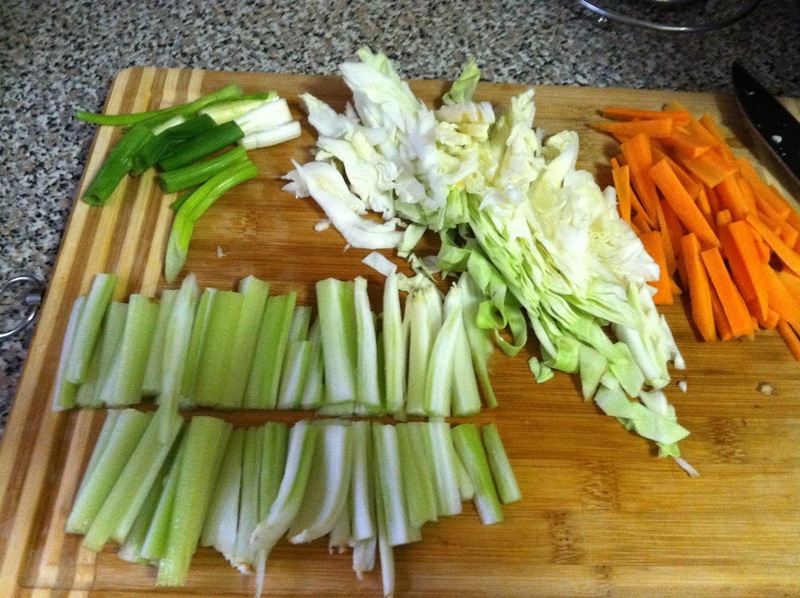 Then I put in all the greens. 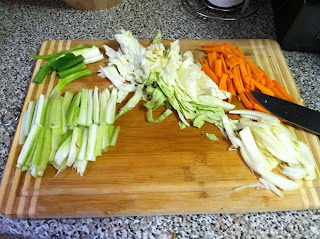 This was a little too much for my little pan to handle, so next time I'll probably have to do the cabbage separately. 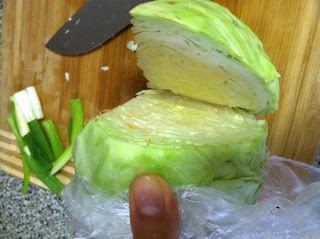 I drizzled in some vinegar to add some texture to the cabbage. 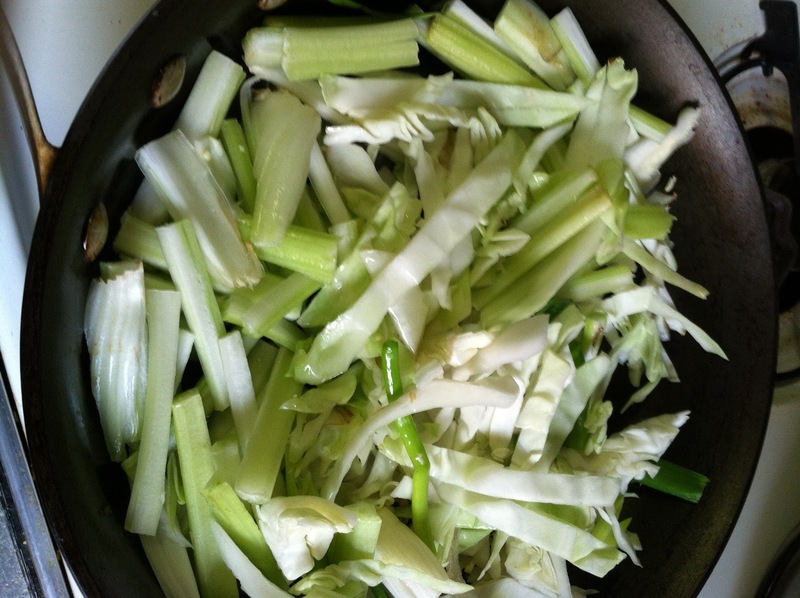 Again, plate or drop the greens into a large pot ready for mixing. Drain out the water from the noodles (that was soaking in the cold water). The recommended recipe is about one tablespoon of brown sugar and two tablespoons of soy sauce. 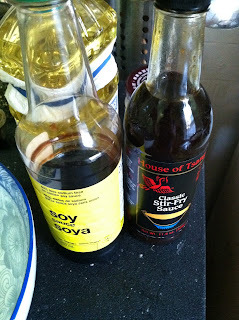 I of course never follow the recipe, and wanted to use up an old dumpling sauce. So I did about 1/2 tablespoon of that dumpling sauce, 1/2 tablespoon of Chinese stir-fry sauce and 1 tablespoon of soy sauce. 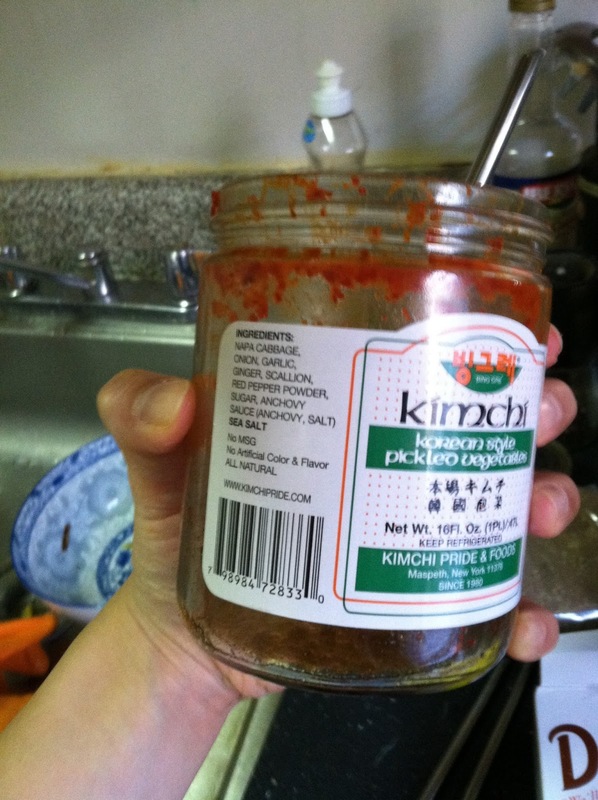 I also had some leftover kimchee spices left from the last of my kimchee (noooo....). 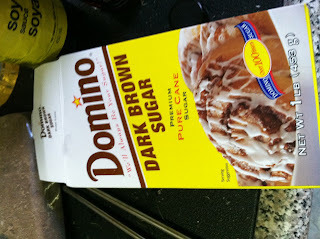 So I mixed in some brown sugar into it and added some water to dissolve it. Looks pretty disgusting, but it'll add some sweet heat to the noodles. Now it's time to mix! I didn't find a bowl large enough for all my ingredients, so I put them in the noodle pot. You want to mix in all the ingredients alongside to another tablespoon of soy sauce and any other condiments you wish to add to this hodge-podge of nutritious deliciousness. 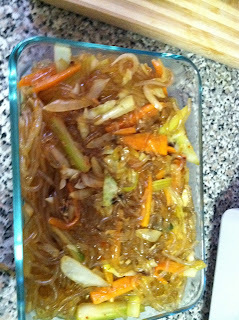 I made enough jap chae for 4 meals (yea totally overboard). 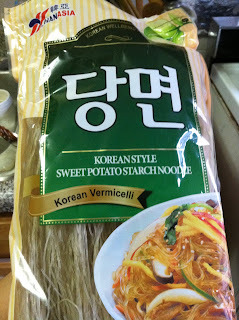 It tasted pretty good - the noodles were soft and chewy, the veggies retained their original taste. I think one thing I would change next time is to use sesame oil to add more flagrance to it, and maybe cut down on the oil too because it was a little greasy everytime I had to fry up another ingredient. Since I was in a mood for cooking, I also chopped up some sweet potato fries and baked it for half an hour with a good drizzle of olive oil and seasonings. And since it's summer, we can't forget corn on the cob! Now we're ready for a summer picnic!